Consumers are going mobile—and for good reasons. A recent report forecasts that 61 million United States consumers will use mobile banking in 2013, up from 47 million in 2012. Mobile banking—which allows consumers to access their funds through their smartphone or mobile device—offers many advantages. Mobile devices offer you greater access to your money than traditional internet avenues. The internet is only accessible in certain areas, whereas mobile connections are more plentiful. Financial experts agree that mobile banking offers many benefits worth using. Through texting, mobile browsers or downloadable applications (apps), financial institutions are offering their members a wide array of options when it comes to accessing their money. Each has its strength. Texting is an effective way to receive notifications from your bank or credit union, such as alerts when your balance has gone below a certain level. Mobile browsers and apps offer ease of navigation and flexibility in checking balances, transferring funds and paying bills. Though the perception may be that mobile banking leaves one vulnerable to fraud and other problems, the reality is quite the opposite. Proponents of mobile banking point out that smartphones are less susceptible to malware and viruses, and should your phone be lost, passwords and ID checks help to further protect your privacy as well as your funds. Though there may be charges for such services as text banking—which vary according to the mobile service provider—mobile banking services are, by and large, free for consumers. The ability to access financial records anytime, anywhere makes mobile banking an appealing service. Many agree that such immediate access helps to prevent fraud and other potential problems, as it allows you quick and easy monitoring of your accounts. If you are ready to join the mobile banking revolution (and are already a HiTel FCU Home Branching user), sign up for MyMobile today! 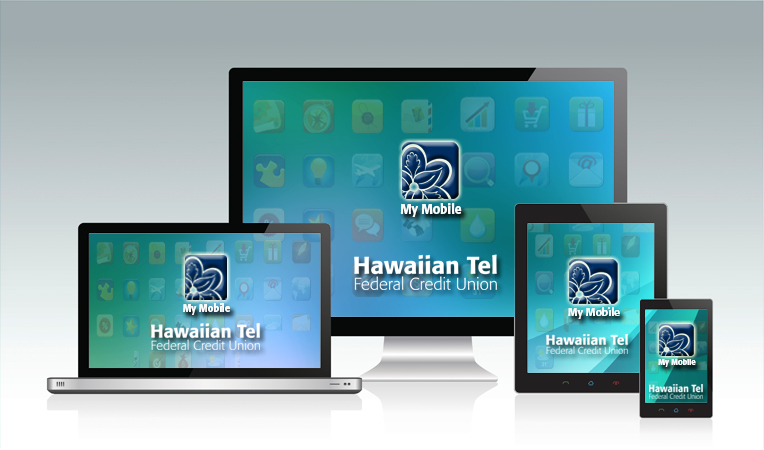 Non-Home Branching users can sign up for Home Branching and MyMobile by clicking on Sign-Up for Home Branching at http://www.hitelfcu.com. This entry was posted in CU News and tagged alert, balance, Bishop Street, credit union, Downtown, easy, ewa beach, finance, Halekulani, hawaii, hawaiian tel fcu, hitelfcu, honolulu, Kaimuki, Kalihi, Kapalama, kapolei, kunia, mccully, mililani, mobile, mobile banking, mobile device, money, mymobile, quick, safety, Schofield, security, smartphone, texting, Wahiawa, Waikiki, waipahu, Wheeler AAF by Hawaiian Financial Federal Credit Union. Bookmark the permalink.